I know Anais has been itching for an update, and I'm working on it. In lieu of that I'll offer up a HNT photo that is a tribute to the stuffie tales of Probitinate in Situ and Cat's photo collection. For a couple years now, my four year-old daughter has had a habit of tying up things. It started with loose pony tail rings, and she'd loop them around some of the smaller animal toys she had. Most of the time she did this without anyone seeing her do it. She doesn't do it as often, but now she's apparently graduated on to shoe strings and stuffed animals. 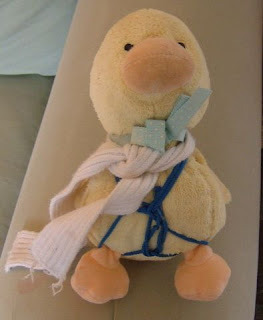 This past Sunday, I noticed that she had been applying her craft to the stuffed animal I dubbed "Snuggleduck" because as a toddler she would hold it when she went to bed at night. Sometimes, I wonder just how concerned I should be about this.